SPOTCHEM EZ | ARKRAY, Inc.
"Let's build an automatic dry-chemistry device that is smaller, faster and cheaper!" 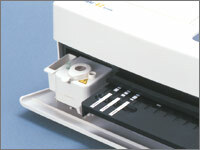 The development of the SPOTCHEM EZ started to achieve this. In order to put it into practice, we set about distributing questionnaires to each and every domestic customer. We found that a majority of customers were performing measurements one sample at a time and that they were using a combination of a multiple test strip and a few single test strips. So we decided to drastically change the specifications of the existing devices. In order to achieve these first objectives, we managed to achieve the goals of single sample aspiration for continuous application on the strips, use of an LED light source and an AC power adaptor. Out of all of these achievements, the integrated micro centrifuge is especially worthy of mention. During development of the micro centrifuge we tested many different types of centrifuge method. After a series of experiments we found that the centrifuge with swing bucket would be the most appropriate for the SPOTCHEM EZ. That was the easy part. With the swing-out centrifuge, there were problems of the center of gravity shifting during the period of centrifugation. Also when centrifuging a single sample, it is standard practice for the customer to position a counterbalance of the same weight as the test sample, opposite it (as a balancing device). However, in this device, to place the balancer would make the operation complicated, there was a risk of losing or damaging the balancer and it was simply not practical. Also, the permanent setting of a balancer to the centrifuge rotor led to durability problems. So one team member proposed a design of the centrifuge rotor with an irregular shape and an incorporated mass equivalent to the counterbalance weight into the centrifuge rotor itself. Then a centrifuge would need to accept different sample volumes to be placed in the centrifuge, which was not satisfied by standard design. The development team therefore began to design a totally new centrifuge to enable smooth rotation of centrifuge rotor in the entire range of acceptable sample volume. To do this, it was necessary to have a design to test multiple measurement items simultaneously. The calculations for obtaining results of multiple items were difficult to make and was not without complications. Luckily, the company ethos was such that the latest design technology could be introduced and the latest three dimensional CAD had been brought in and its calculation tools were used for the more difficult calculations. This is how the built-in micro centrifuge on the market at the moment, was completed. We thought about the fact that "if the balance is off, we cannot raise the number of revolutions" from the other end: "the number of revolutions is not increased because the balance is off so this is either because of the insufficient sample volume or the absence of centrifuge container. From the number of rotations in the initial rotation period, we established a number of rotations to be reached. We designed software to detect insufficient sample volume error (or a no centrifuge error) when the set number of rotation was not reached, allowing a user to quickly find a problem. These great inventions could not have occurred without the twin blessings of our excellent team members and such a good environment for development. 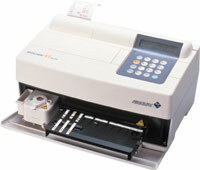 Ever since its launch in the summer of 2000, the SPOTCHEM EZ has received very high praise from customers. In 2004, it received the New Device Advancement Award (Prize of "President of Japan Society for the Promotion of Machine Industry") under the auspices of the Japan Society for the Promotion of Machine Industry Technical Research Institute. The basis for this award was that it was an automatic desktop analyzer that can be used easily even in small clinics and it has a small centrifuge built-in thus automating a lot of previously troublesome preparation. As a result, compared with traditional devices, its focus on small size, light weight and low energy consumption received a lot of praise.